By Tim Clark – Hawaiian Island weddings, Inc.
Then there is your wedding day - now you have to call the photographer to make sure he will be at your hotel at the proper time to get your pre wedding portraits taken, rush out to pick up your dress from the presser, go to the flower shop and pick up your bouquet and leis for your guests, show up early for your hair & make-up appointment at the salon, make sure that you have your license and your rings, and get to the wedding site in time to tell your guests where to go. After you have been running around all day, your exhausted. Then the worst possible thing happens... it starts to rain! Your beautiful beach wedding is unraveling around you. The musicians say that they won't take their instruments out in the rain and that they need a indoor location to play, the videographer isn't taking his $30,000 digital camera out in the rain because it will stop working in high humidity, your beautiful silk gown is getting ruined, and your hair is a mess after you just spend $200 on the hairstylist! There are a number of qualified, prepared, and experienced wedding coordinators in Maui who would have been able to fix your wedding disaster. They would have make all the arrangements, coordinated all the vendors, flowers, and reception. On your wedding day you could have been having your pedicure out by the pool while sipping on Champagne without a care in the world. 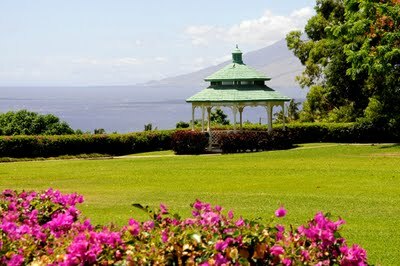 If you are considering arranging your own wedding in the islands, GOOD LUCK! Why don't you just hire a wedding planner to can do it all for you. Make sure that your wedding coordinator puts it all in writing and is affiliated with the Better Business Bureau. Make sure that they know what your wishes are and guarantee that they can produce your wedding - come rain or shine. 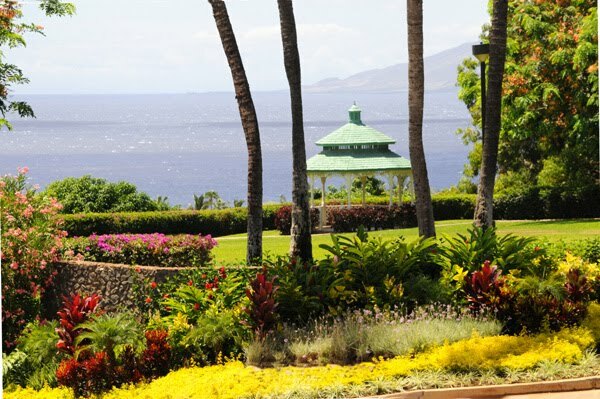 A new wedding site... ok, well it's not new, but the name of the resort has changed and now it's more affordable, is the Ocean View Gazebo at the Wailea Hotel (formally the Diamond Resort). I remember doing a few weddings here many years back, and it was a very nice venue. Back then the wedding had to be catered by the resort, which was very nice but pricey. I was told recently that we can have our own caterer come in and have the reception right out on the grass by the gazebo. So here you really can have that ocean view wedding location and your reception only steps away for a lot less that some of those sites you may have been looking at. Only about $1500 for the site (includes having the reception there) is a good price. 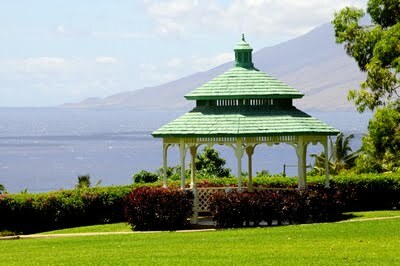 You can start with our Molokini Sunset Wedding and we will arrange our caterer to come in and handle the reception. Add a number of additional options in the blue section on the left (see the package link above). I had a chance to stop by on a beautiful Maui day and take some photos for you. This place is immaculate! The view are extraordinary and the privacy is total! This is a great place for any couple who are bring from 12-50 or more guests. Ask us for a complete catering menu.